Hammers catcher Layne Morgan after catching a foul ball for an out in the Hillsboro Tournament of Champions. 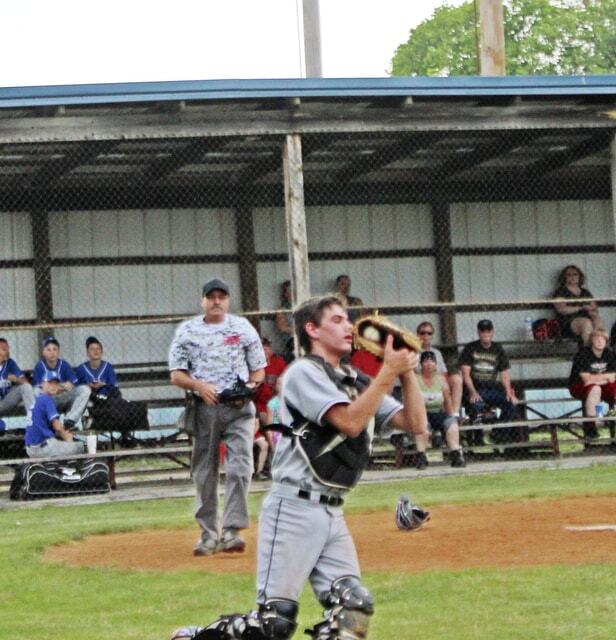 The Highland County Hammers were back in action at Zane Trace High School Tuesday evening taking on league opponent Chillicothe Colts Post 757 bringing home an 11-6 victory. The Hammers started off the game scoring two runs off Colts starting pitcher Harley Patterson on just one hit and three walks. The Colts evened the score collecting two runs of their own on one hit, one walk, and then an error by the Hammers shortstop. The Hammers scored two more runs in the second inning off of singles by Tucker Ayres and Andrew Dingey but the Colts evened the score once again with two more runs. In the third inning, the Hammers loaded the bases with no outs only to score one run on a suicide bunt by Sam Buddelmeyer leaving three runners stranded. The Colts took the lead scoring two runs in the bottom of the third inning which were their final runs of the game. The Colts scored the two runs on three hits, a walk and a hit batter off of Hammers starting pitcher Matthew Spears. The Hammers then struck for three runs in the fourth inning. Spears singled with one out in the inning and Austin Harrison was walked. Jared Thompson then singled loading the bases. Luke Middleton came to the plate and lined a single to centerfield scoring Spears. Austin Arellano came to the plate and hit a flare shot over the first baseman’s head scoring Harrison and Thompson to give the Hammers an 8-6 lead. Spears shut the Colts down in the bottom of the fourth inning striking out one. Layne Morgan led off the fifth inning for the Hammers lining a double to left field. Morgan eventually scored on a fielder’s choice by Ayres. Relief pitcher Sam Buddelmeyer entered the game in the fifth inning striking out the first two batters he faced and getting the third to ground out to Harrison to end the inning. Ayres, Harrison and Buddelmeyer started the sixth inning off with singles. Ayres scored on a base hit by Morgan. Buddelmeyer came on again in the sixth allowing no runs. The Hammers scored their final run of the game after Ayres and Harrison singled and Thompson was hit by a pitch loading the bases. Centerfielder Luke Middleton collected his second and final RBI of the evening getting hit by a pitch. Colts shortstop Austin Booth led off the seventh inning for the Colts with a walk. Hammers catcher Jared Thompson threw Booth out at second base as Booth was attempting to steal second for the first out of the inning. The next batter grounded out to Buddelmeyer. Buddelmeyer recorded the final out of the game with a strikeout by Patterson. Matthew Spears pitching line was four innings, giving up six runs on six hits striking out two, walking one and hitting two batters. Spears collected his third win of the season. Sam Buddelmeyer notched his first save of the year going three innings, giving up no runs, one hit, one walk and four strikeouts. The win puts the Hammers at 4-2 in second place in their division with an overall record of 10-8. The Hammers next game is Saturday in Leesburg.